in a mixed material stream to provide a high quality, single polymer output. 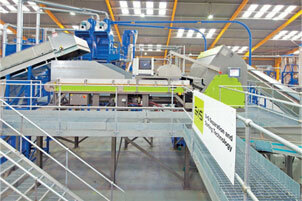 The Varisort N from S+S Inspection is used by leading plastics recycling companies to produce high purity polymers. The Varisort N is a complete integrated system and the key to its effectiveness is a combination of robust mechanical design, a full array of Near Infra-Red (NIR) detectors and electronically controlled precision air jet ejection nozzles to identify and remove unwanted fragments with the minimum loss of 'good' polymer. The feed to the system is a high speed conveyor on which the material is spread evenly with individual bottles and containers singulated before reaching the detector stage where identification technology identifies material within the mixed material stream.